My great grandfather was wounded at the Battle Cedar Creek. If he had not survived, I wouldn’t be here. 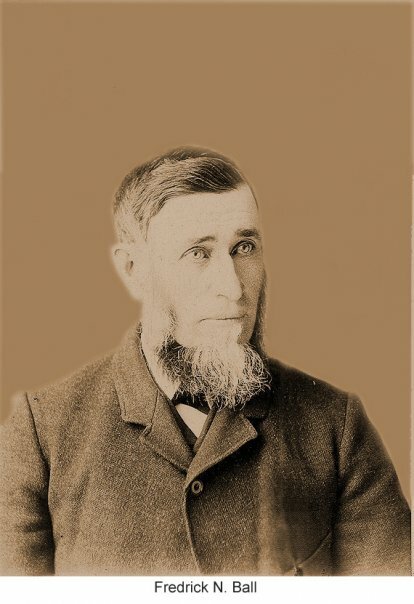 Through accidents of timing and draft lotteries, the last person in my direct line to fight in a war was my paternal great grandfather, Frederick Nathaniel Ball. His last battle happened to be memorialized in a famous poem. I’ll tell you more about that in a moment. Frederick was a Yankee. He was just a young man from Connecticut, who found himself serving in Colonel Phillip Sheridan’s Union Army during some of the most decisive action of the Civil War. Sheridan’s orders were to take Virginia’s Shenandoah Valley in order to stop the Confederates from using it as a base for attacks into the North. He was further ordered to render it useless as a source of provision for the Southern army. This meant commandeering livestock, destroying railroads, burning barns, mills, and crops. Sheridan executed his orders so thoroughly the campaign was called “The Burning” by Southerners. The scorched earth tactics used by Sheridan foreshadowed the more extensive March to the Sea through Georgia by Gen. William T. Sherman. The turning point in the Shenandoah Campaign came at the battle of Cedar Creek on Oct. 19, 1864. The battle started out as a complete rout by the Southern troops. The Yankees had been surprised at dawn by Jubal Early’s Confederate veterans. Sheridan was returning from Washington and had spent the night in Winchester, several miles away from the front. When his troops were attacked, he heard the artillery, and raced on his horse to get to the fight. Legend has it that Sheridan arrived just in time to rally his soldiers and turn the tide. 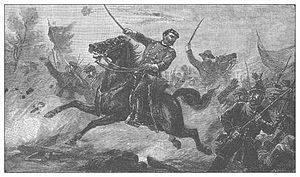 This legend was amplified in a heroic poem by Thomas Buchanan Read called “Sheridan’s Ride.” The poem helped made Sheridan a hero in the North, and is even said to have helped Lincoln win re-election. My great grandfather was right in the thick of this battle, and his experience has served as both a point of pride — and a cautionary tale — in my family down through the decades. As the story has been handed down, Frederick was shot through his side. He stuffed a rag in the bullet hole to staunch the bleeding and managed to crawl back to safety. In this time before antibiotics, the odds of surviving a serious war wound was not great. Frederick was one of the lucky ones. In a few months the war would be over. He would head west to seek better prospects and cheaper farmland in Iowa. He married, raised a big family, which included my grandfather. Eventually the tribe drifted down into Missouri. I can still remember my parents taking the book “One Hundred and One Famous Poems” down from the shelf and reading classics by Henry Wadsworth Longfellow, James Whitcomb Riley, and Eugene Field. My taste in poetry has changed a bit since those days when I sat enthralled listening my father read Thomas Buchanan Read’s poem. But it’s a good example of a panegyric ode and it tells a rip-roaring good tale. Here, for your edification, is the complete text of “Sheridan’s Ride.” They just don’t write poems like this anymore! With Sheridan twenty miles away. Foreboding to traitors the doom of disaster. What was to be done? what to do?-a glance told him both. Hurrah! hurrah for horse and man!